A windmill in Fenner caught fire Friday night, lightening the night sky with flames. Smithfield Volunteer Fire Department responded to a call around 10:30 p.m. on Peterboro Road in the town of Fenner to the scene of a fire at the top of a windmill. Chief Chet Reeves said he hadn’t seen anything like this, though this was a year of firsts for Smithfield – having a helicopter crash and tornado in the town earlier this year. 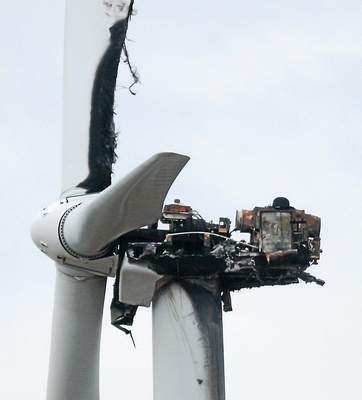 Reeves said when Smithfield and Morrisville fire departments arrived at the scene, it was determined the generator housing was ablaze, sending flames up the tip of one of the blades. The departments determined letting it safely burn down was the best course of action. Reeves said the fire was out and both companies = left the scene by midnight.